Marco Rubio: Federal Marriage Amendment "Steps on the Rights of States"
Sen. Marco Rubio (R-FL) listens during a news conference on a comprehensive immigration reform framework January 28, 2013 on Capitol Hill in Washington, DC. Last night, after a typically un-harried day for Congress, BuzzFeed brought Sen. Marco Rubio to the 201 Bar for the inaugural edition of “BuzzFeed Brews.” The bar, located between the Senate offices and Union Station, is often taken over for conservative happy hours and short-notice events. BuzzFeed classed up the place, paying for an open bar (beer, wine, rail) that occupied the hundred or so people unable to get close to Rubio. Those lucky enough to get to the front heard an unusually good interview with a politician who too typically dazzles with talking points. 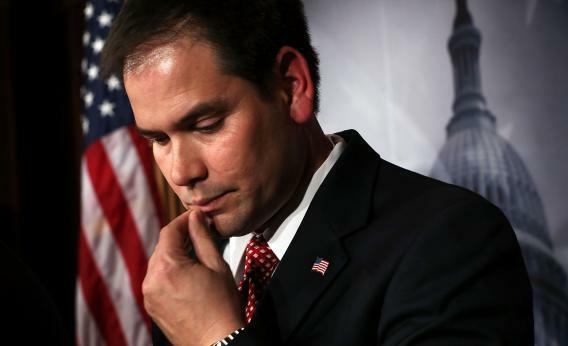 Buzzfeed’s editor-in-chief Ben Smith disarmed Rubio quickly. His first questions were about the senator’s well-publicized love of mainstream hip-hop, including Pitbull—“Armando, that’s his real name,” reminded Rubio. But then Smith asked Rubio about one of the poison bills that could sink immigration reform: reciprocal rights for gay couples. Rubio, surrounded by twenty-somethings and thirty-somethings, did not give this the snarky treatment perfected by John McCain and Lindsey Graham. “I hope that doesn’t become the significant issue in this debate,” he said. But people could talk, and people could listen. Smith followed up: Where was Rubio on gay marriage? In 2011, a response like that wasn’t enough for a Republican presidential candidate. The Iowa FAMiLY Leader shuttled around a “marriage vow” for the contenders to sign; it committed them to “steadfast embrace of a Federal Marriage Amendment.” The National Organization for Marriage got all of the top finishers in Iowa to pledge to “support sending a federal marriage amendment defining marriage as the union of one man and one woman to the states for ratification.” All of this even though nobody who covers politics thinks that the FMA, which failed in 2005’s Republican-run Senate, can ever pass. Rubio, who gamely went along with Smith’s 2016 speculation (“you don’t get the big plane until the end”), wouldn’t go along with this.